51 anglers fished today in wet & windy conditions. 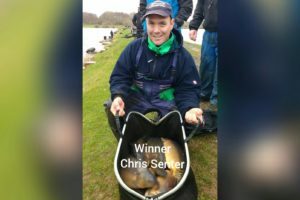 Winner on the day was Chris Senter (Shakespeare) peg 42, Match burr, catching 122-01-00 of fish. 3rd on the day was Danny Baker (Tredegar A/C) who drew peg 26 on the Match Grass weighing in 103-03-00 on method and short pole. 4th placed Jamie Harrison (Matrix Bait- Tec) drew peg 20 on the Match grass weighing in 94-09-00. 5th on the day was Geoff Valance (Preston) who drew peg 6 on the Speci burr landing 91-12-00. 6th on the day was Ian Wood (Bag’em Larford) who drew peg 74 on the Speci Chalet with a weight of 89-09-00. Danny Baker, Geoff Valance, Brian Jones, Geraint Powell & Mark Turner all qualify for the Grand Master final. Geraint Powell & J Turner also qualifies for the Bag’em Larford Classic final too.